The New York Times drives across Nevada. 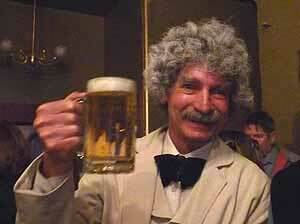 Last fall I was talking with McAvoy Layne, who portrays Mark Twain on stage, screen and the paddlewheel steamer Tahoe Queen, and as we cooled our pipes with glasses of beer late on an amiable afternoon, our talk came around to Sam Clemens taking his famous pen name. Every schoolchild knows that Sam Clemens first used the pen name Mark Twain on February 3, 1863, while he was a reporter for the Territorial Enterprise in Virginia City, NT. What’s not so well known is that he took the name, not as a tribute to the river pilot Captain Sellers (as he wrote in Life on the Mississippi) but from John Piper’s facetious way of calling out additions to his bar tab in John Piper’s saloon. Sam and his pals on the Enterprise used to stop in at the Old Corner Bar in Piper’s Opera House after they put the paper to bed. When Sam bought a drink for Dan De Quille, Steve Gillis or another one of his running mates, he called out “Mark Twain” and John Piper chalked the two drinks on his tab. McAvoy Layne as Mark Twain recounted the historic event. The Old Corner Bar at Piper’s Opera House in Virginia City, where Sam Clemens became Mark Twain in the winter of 1862-’63. tread the hallowed planks where it all took place nearly a century and a half ago! We decided it would be great fun, and that having thought of it we were now morally obliged to do it. Surely an epic stroke of genius deserves to be made manifest. So we started by assigning responsibilities. McAvoy suggested he would be responsible for the Sam Clemens/Mark Twain aspect, if I would just do the rest. 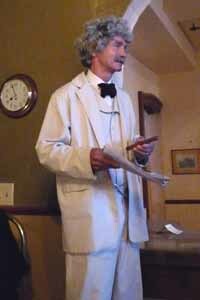 Saturday night last we gathered together in Virginia City with some of the top journalists of northern Nevada to re-enact an event that took place at John Piper’s Corner Saloon on February 3rd, 1863 — the day Sam Clemens took the cognomen, “Mark Twain”. We sequestered our 22 jack-leg journalists at the Cafe del Rio for a Basque style meal in a private room upstairs, where we might not disturb the docile diners downstairs. The Del Rio had just won a big prize in the 27th annual Chili on the Comstock Regional Cook-off, so the staff were in high spirits when we arrived. By the time we left for the Corner Saloon, however, they looked somewhat shopworn, and happy to see us go. 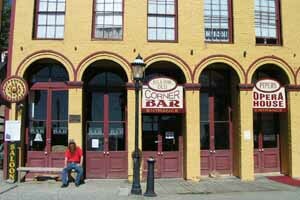 At the Corner Saloon, nestled in the south-east corner of Piper’s Opera House, we were greeted by a cast of characters including such 1863 notables as Joe Goodman, Alf Doten and Rollin Daggett. David Toll took on the role of John Piper and silenced the crowd, a near impossible feat, and then Sam Clemens climbed up onto a hay bale and told it pretty much as it happened. . . .
‘twain,’ being the biblical term for ‘two.’ But now I’m going to tell you the truth. You see, Carlyle, that great Scottish cynic, said that a lie cannot live. Well that just goes to show you, he did not know how to tell them. For if I had taken out a life policy on that one lie alone, the premiums would have bankrupted me ages ago. And so it went, on into the night at the old Corner Saloon, much like nights of old, when newspaper hacks jawed about current events, politics, crooks and wildcat opportunities. 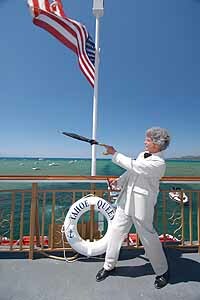 I can’t remember having so much fun in the white suit! Nevertheless, as some nitpickers suggest, some questions remain. They will be addressed in a future issue; in the meantime all comment is welcome. except for use as overflow by the other Black Gaming corporation properties in Mesquite . . . Starting Sunday August 15th the Wells Sunday Monthly Flea/Crafts/Farmers/ Stuff Market will be held from 9 am – 1 pm in the 6th Street Parking Lot Between Luther’s & Wild West Inn. 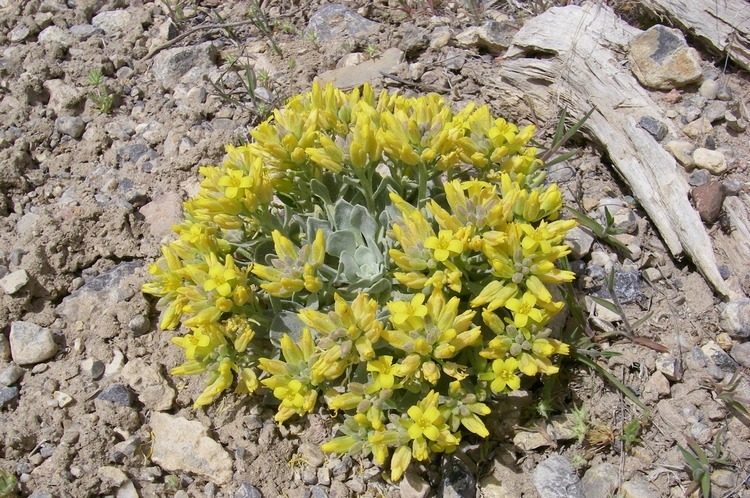 For More Information e-mail Cliff Martine or call 775-752-3888 . . .
Nevada art collector and connoisseur Wally Cuchine of Eureka makes it a point to visit Ely’s Arts in the Park each year, and exults in the discoveries he makes. 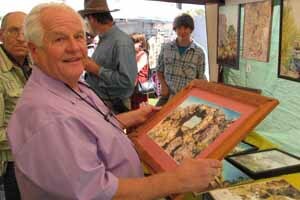 Some excellent eastern Nevada artists show their work here. Slipped out of town for a drive east to Ely for‘ Arts in the Park’, found great Nevada art from people who know the real value of things. If that sounds snarky, what I mean is: the old guys we bought from have been HS art teachers, now retired, going out and painting what they love, as they love to do it, and then once a year bring their stuff to the park in downtown Ely on a sweet sunny day in August, show them, sell them, and go home with a pocket full of cash. Tell that to someone in the “Art World” and they’d sniff at it, but these guys are happy and content, and their work is terrific . 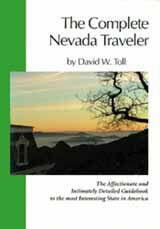 . . How many people can point out Nixon on the Nevada map? Of all our readership, maybe two dozen. And how many can say what pioneering effort the Pyramid Lake Paiute Tribe at Nixon is participating in? It’s solar energy generation, and here’s the story . . .
Eureka was gleaming with the annual Eureka “Show What Ya Brung” Car Show in May, held in conjunction with the annual transcontinental Highway 50 Yard Sale. 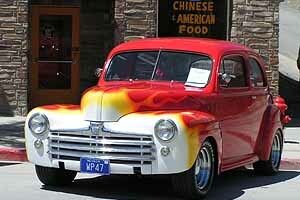 This is a 1947 Ford, and yes the Chinese Restaurant is open. Gathering. Obviously the tough times aren’t over yet, and the Center has cut spending sharply. If you’d consider joining others in ponying up a gift to help ensure that the National Cowboy Poetry Gathering and the other year-round programs survive and thrive into the future, you can donate online or call Linda Carter at (888) 880-5885 or (775) 738-7508, ext. 222 . . . There’s a 115th birthday party for Edna Purviance being planned for October 23 at the Martin Hotel in Winnemucca, involving dinner and a program afterward. Please send an e-mail with “Edna” in the subject line if you’d like to come. 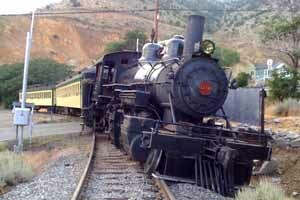 Some participants will come by train from Reno and back again, and you’re welcome to be a part of the group . . . Another new hotel casino on the Las Vegas Strip? Yes indeed, the Cosmopolitan Las Vegas will have a soft opening in December and a Grand Opening on new year’s eve. The 2,995-room, 50-story resort stands between the Bellagio and City Center, which also opened recently. In the meantime, Las Vegas Strip gambling revenue fell 7.6 percent in June, the third straight monthly decline.